The Center for International Private Enterprise and Partnership for Transparency jointly hosted a public forum on December 8, 2017 in Washington DC on “Meeting the Challenge of Sustainable Anti-Corruption Reform.” The keynote speaker, Dr. Delia Ferreira Rubio from Argentina, made her first public speech in the United States since her election as Chair of the Board of Directors of Transparency International (TI). Campaign finance is at the core of so many different corruption issues and activities, but now we are increasingly seeing the participation of organized crime in this area and we may well need new approaches and new tools to confront this dangerous phenomenon. The successes of anti-corruption campaigns are now promoting pushback to a rising degree – it is like a game of chess where just as one side is winning, so the other side retaliates – people found guilty in the courts are being pardoned, efforts to curb the freedom of civil society are mounting, actions to undermine anti-corruption commissions are gaining ground. We must find ways to guarantee the real independence of judges and anti-corruption agencies – they must be well funded and they must have meaningful authority to act against all forms of corruption by all public and private sector people. We need to ensure that our anti-corruption actions are clearly focused on the greatest challenges and most important priorities. We should seek to find ways to channel public protests into meaningful paths – we must channel this powerful energy – so that people can enjoy meaningful rights to public information, full whistle-blower protections, and the adoption of new forms of technology to increase transparency and accountability. To make progress in this regard we must show citizens that their protests and their engagement leads to results that improves their lives and that their participation in protests creates real benefits. There has to be still greater efforts to ensure that integrity is far more widely and fully accepted as a core value by public and private sector leaders and there must be transparency approaches that demonstrate this – integrity in this context means such things as clear application of conflicts of interest standards, ending revolving doors between business and government, and other measures. If we look longer-term, then sustainable anti-corruption reforms will depend on basic education – nothing less than strengthening education systems in many countries so that young people have a far clearer sense of what is right and what is wrong. Written by Frank Vogl, a co-founder of Transparency International and the Partnership for Transparency. CIPE has provided a video stream of the full event. 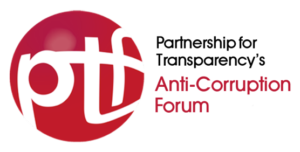 Keep an eye out here for upcoming Anti-Corruption Forum News. Abdulwahab Alkebsi is the Deputy Director for Programs at the Center for International Private Enterprise (CIPE), a non-profit affiliate of the U.S. Chamber of Commerce and one of the four core institutes of the National Endowment for Democracy (NED). Alkebsi oversees more than 120 programs in over 55 countries and supervises a staff across nine countries, including Egypt, Iraq, Jordan, Tunisia, Nigeria, Ethiopia, Afghanistan, Pakistan, and Ukraine, and at CIPE’s head office in Washington, DC. In his role at CIPE, Alkebsi oversees democracy and market-reform initiatives that combat corruption, build the capacity of business associations to represent private sector voices, strengthen entrepreneurship skills and ecosystems, empower women, organize the informal sector and strengthen property rights, enable access to information, and improve corporate and democratic governance. Prior to joining CIPE, Alkebsi served as the Director of the Middle East and North Africa division at the NED, and prior to that, Alkebsi served as Executive Director at the Center for the Study of Islam and Democracy (CSID), a non-profit think tank, based in Washington, DC, dedicated to studying Islamic and democratic political thought and merging them into a modern Islamic democratic discourse. Frank Vogl is the co-founder of two leading international non-governmental organizations fighting corruption — Transparency International and the Partnership for Transparency Fund. He teaches at Georgetown University, writes regular “blog” articles on corruption for theGlobalist.org and lectures extensively. Frank is also a specialist in international economics and finance with more than 45 years of experience in these fields – first as an international journalist, then as a senior World Bank official and, since 1990, as the president and CEO of a consulting firm, Vogl Communications Inc. Learn more about Frank Vogl on his website. Dr. Delia Matilde Ferreira Rubio, before being elected chair of Transparency International’s International Board of Directors, was the former president of Poder Ciudadano, Transparency International’s chapter in Argentina. She has served as chief advisor for several representatives and senators at the Argentine National Congress and has advised the Constitutional Committee of both the House of Representatives and the Senate, and the National Accounting Office. Currently she works as an independent consultant, and has consulted on anti-corruption related issues with international organizations and NGOs, mainly in Latin America. She has a Ph.D. in law from Madrid’s Complutense University and is the author of numerous publications on democratic culture and political institutions, comparative politics, and public and parliamentary ethics. Dr. Ferreira Rubio was elected to TI’s board in 2008 and 2011 and then again as chair in 2017. Professor Alina Mungiu-Pippidi is Professor of Democracy Studies at the Hertie School of Governance in Berlin. Her research centers on anti-corruption policy and good governance. Mungiu-Pippidi chairs the European Research Centre for Anti-Corruption and State-Building (ERCAS) where she managed the FP7 research project ANTICORRP, and currently the Horizon 2020 project DIGIWHIST. Her governance work is cited and applied by a string of development organizations, by some EU governments and the European Commission. Mungiu-Pippidi has received the Harvard University Shorenstein Fellowship, an Open Society Institute Fellowship, a Fulbright Fellowship and the Jean Monnet Fellowship of the European University Institute. She is President of the Romanian Academic Society (SAR) and founder of the social media watchdog platform Clean Romania! (romaniacurata.ro). She studied political science at Harvard University after completing a Ph.D. in Social Psychology in 1995 at the Alexandru Ioan Cuza University of Iaşi in Romania. Andrew Wilson is the Managing Director of the Center for International Private Enterprise (CIPE) in Washington, DC. Prior to assuming the role as head of the organization, Wilson was Deputy Director for Strategic Planning and Programs, where he oversaw staff efforts to develop and implement program strategies, coordinate internal proposal development, monitor knowledge management activities, and manage relationships with donors. Previously, he was the Regional Director for Europe, Eurasia, and South Asia at CIPE, where he directed grant and technical assistance programs to the aforementioned regions and coordinated CIPE’s corporate governance efforts across the globe. Working with CIPE he has extensive experience in dealing with private sector development issues in conflict and post-conflict settings, crafting successful business strategies to reduce corruption, encouraging entrepreneurship development, strengthening business advocacy, and the promotion of economic reform. He is currently a co-chair of the Private Sector Council at the Open Government Partnership (OGP).